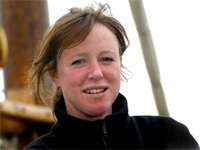 Talk to Bessie Ellen’s skipper & owner Nikki Alford for information and booking. For any queries regarding Bessie Ellen and her voyages, feel free to contact Nikki directly. Please bear in mind Nikki is often at sea so can take a few days to respond. For a swifter response, or to book a voyage, please email or call Nikki’s own agency, VentureSail Holidays. Alternatively, please fill out the following form and we will be in touch with you as soon as we can.